Focusing on contemporary challenges, this major new Handbook offers a wide-ranging collection of cutting-edge essays from leading scholars in the field of Security Studies. It encompasses issues ranging from pandemics and environmental degradation to more traditional concerns about direct violence, such as those posed by international terrorism and interstate armed conflict. 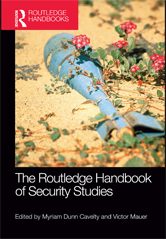 A comprehensive volume, comprising articles by both established and up-and-coming scholars, the The Routledge Handbook of Security Studies identifies the key contemporary topics of research and debate today.